TMK | Reference | Oops! When translating screen text and instruction manuals from Japanese to English, sometimes typos and grammatical errors slip by the editors. Note that game packaging and manuals are often prepared well in advance of the actual release, which explains why "wrong" screen shots or Japanese screen shots sometimes appear in manuals. Nobody's perfect. So, be on the lookout for the errors listed below if you own any of these books or games. Since Game Over is one of the more well-known video game books, some of its mistakes about Mario's history have unfortunately been referenced in other publications. Note: These errors are from the 1993 printing of Game Over by David Sheff. It is unknown if any were fixed for the 1999 re-release, Game Over: Press Start to Continue. Error: Author David Sheff explains how Mario got his name on page 109. While Nintendo of America staff members were naming the Donkey Kong characters, the owner of NOA's warehouse came by, angry about a late rent payment. When he left, they had their name: "The landlord's name was Mario Segali. 'Mario,' they decided. 'Super Mario!'" Correction: The landlord's last name is "Segale," not "Segali." You can visit the Segale Properties website at SegaleProperties.com. Error: Page 51: "[Shigeru] Miyamoto borrowed freely from folklore, literature, and pop culturewarp zones from Star Trek, empowering mushrooms from Alice in Wonderlandbut his most captivating ideas came from his unique way of experiencing the world and from his memories." Correction: Miyamoto says that the mushrooms were not borrowed from Alice in Wonderland during the Iwata Asks: New Super Mario Bros. Wii interview: "Some time ago I was being interviewed and I spoke about Alice in Wonderland. But it seems there was some misunderstanding and it's since been stated that I was influenced by Alice in Wonderland. That isn't the case. It's just that there has always somehow been a relationship between mushrooms and magical realms." Additionally, there are no "warp zones" in Star Trek. Error: Pages 44 and 52 refer to a town called "Sonebe," where Shigeru Miyamoto grew up in Kyoto, Japan. Correction: The town's name was actually "Sonobe." In 2006, Sonobe was merged with other towns to form the city of Nantan. Correction: There are no flagpoles in Super Mario Bros. 3; each standard level ends with a "roulette block" in front of a black background. When Game Over was published, only Super Mario Bros. and Super Mario Bros. 2 (Japanese version) had flagpoles. Error: Pages 53 and 54 give us an example of what it was like in the production stages of a game before technology improved: "[Miyamoto] showed programmers not only how the character looked but how it moved and what special traits it had (a bee, when hit, lost its wings but continued to stalk Mario; boats made out of skulls sank into a fire pit)." Correction: The only bees at the time were in Super Mario Land and Super Mario Land 2, and they fall harmlessly off the screen after Mario stomps them. We assume that Sheff was thinking about a different flying enemy, because the Mario Land series was produced by Gumpei Yokoi, not Miyamoto. The summary in the last Save Album starts with "The Shroob's have been beaten!" In this sentence, the noun "Shroob" is pluralnot possessiveand therefore does not take an apostrophe. Page 32: A line under the Shopping section reads, "Approach either side and speak to the sales-Toad to make the corresponding menu will appear." It looks like the editor(s) reworded this sentence and forgot to delete will. In Little Fungitown, after Luigi gets hypnotized, go back and talk to Peach. She'll say, "Wow! Luigi! You're face looks so much more...manly!" The word should be Your, of course. The fifth tournament is called "Boo Clasic." The correct spelling is Classic. Page 28: The Toad HighLands course is called "Toad Forest" on this page. Toad's third text box in the Approach Shots tutorial is missing the capital "I" in "If" to start the sentence. The game text reads, "f you press B and the power meter turns blue, it means you can hit an approach shot." Page 31: The description for Bowser's Castle shows you where to "Watch for falling rocks!" There are no falling rocks in Bowser's Castle. Page 9: One line under the Driving Techniques section reads, "Release R to perfprm a mini-turbo." This typo was fixed in later releases. Page 12: The Blooper description has one "the" too many: "Sprays ink on the all of the karts in front of you, obscuring those drivers' view of the track." On the back of the Canadian version's case, the first bullet point reads, "Frantic speed, crazy new items, multiple karts per character, and an all-new mission mode makes this a Mario£Kart fan's dream!" Page 21: The description for Koopa Troopa Space explains, "When you want save your game, stop on this space and press the A Button." Insert a "to" to make it read "want to save". Page 22: The last sentence in the "Cellular Shopper" description reads, "Its perfect for emergencies." Its should be It's. Page 29: The description for the Swap Card item reads, "Whoever uses this items exchanges items with another player." Change the first items to item. One of the turban-wearing Toads in Dry Dry Outpost refers to Merluvlee as Merluvee. Watt is referred to as a female when she joins your party, but when upgrading her, the description starts with, "He'll master Turbo Charge..." for Super Rank and "He'll master Mega Shock..." for Ultra Rank. After defeating the final boss, the back of the Toad Town news board refers to Lady Bow as Lady Boo. The sign by the Li'l-Oink farm calls them "Li'l Oinks," but Goombario and the Toad who stands next to the farm call them "Li'l-Oinks." The same Toad will refer to them as "Li'l Oinks" if you choose "No" when he asks if you'd like to learn about Li'l-Oinks. When you meet Yoshi on the castle roof, he says, "Mario!!! It that really you??? It has been so long since our last adventure." 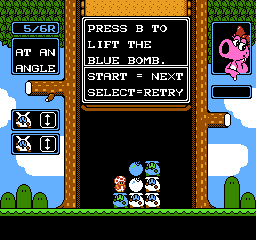 Unless they were trying to emulate Yoshi's broken English from the cartoon series, the first It should be Is. When Yoshi picks up Mario's hat in Course 1, the game informs you, "While playing as Mario in Standard Mode, you can punch, grab, and throw objects and enemies by pressing (A button). You can also perform the famous wall kick! Just press (A button) to jump against a wall, then press (A button) again to jump high." Both A buttons in the last sentence should be B buttons. Page 21: In the Mario & Luigi mode description, the last sentence reads, "Chose this mode when you want to play with a friend." This should be Choose. Page 22: The "Mario" label points to the Start Panel instead of Mario. As you may or may not know, Nintendo took a Japanese game called Doki Doki Panic, plugged in four Mario characters, and released it in North America as Super Mario Bros. 2. They did a haphazard translation and left a lot of bugs and errors. The credits have Clawgrip spelled as Clawglip. Most, if not all, R/L problems like this occur because "R's" in Japanese have more of an "L" sound. Page 20: The second paragraph reads, "If you place a door in a certain place, there will be a heart that will increase your life meter." Change heart to Mushroom. Doki Doki Panic had a big Heart instead of a Mushroom. Page 24: The screen shot of Phanto on page 24 is actually a screen shot of the Phanto from Doki Doki Panic. Pages 26 and 27: In the Enemies section (and game credits), the names Birdo (p. 26) and Ostro (p. 27) are switched. The error is obvious once you read the descriptions for each enemy. An enemy is "Hoopstar" in the credits but "Hoopster" in the manual. An enemy is "Triclyde" in the credits but "Tryclyde" in the manual. In the N-Spade matching game, Toad says, "Flip over two cards and see if they match. Miss twice and your out!" Toad is really saying "you are out," so the correct grammar is "you're out!" Since there is no more room in the text box to correct this, the sentence was rewritten in later releases of SMB3. Page 14: The Moves You Already Know section shows a "jumping out of the water" move. However, SMB3 was the first Mario game where you can jump out of the water. The cloud enemy in Land's End calls himself Mokuka, but in battle, his name is Mokura. The second time in Bowser's Keep, when you're fighting against the Tub-o-Troopas, it says Heavy Troopas are readybut those were characters earlier in the game. In Monstrotown shop, three Goombas sell a Mushroom that recovers 30 HP but turns you into a mushroom if used during battle. The description box for this Mushroom says "Recoers 30 HP..." Obviously, they meant Recovers. Axem Black's psychopath line uses the contraction for "you are" instead of "your." It reads, "You're timing stinks!" One enemy is "Dino-Torch" in the credits but "Mini-Dino" in the manual. Several trophy descriptions contain errors. Note that later versions of SSBM may have fixed some of the errors. The game tells you, "EXTRA 2 Opeeed!" when you have opened the Extra stage in World 2. Page 15: There are two "? Block" labels. The second occurrence should say "? Switch". Page 19: "With a ground pound, all the White Shy Guys on the screen will change to lucky fruit." Omit the word White to make that a true statement. Thanks to: Kulock (PM - "Lady Boo"), Bird Person (M&L:SS), NintendoExpert89 (MG:TT, SMA4, Mario Party3, Wario's Woods), Spazzo (MKDS box), SolidShroom (SM64DS), Nathan (SMA4), radiodj19 (PM - Watt), teh_yoshi and Fifth (SMA3). The Mushroom Kingdom \ Reference \ Oops!